HÀ TĨNH — A year after it caused mass fish deaths by discharging untreated waste directly into the sea, an inspection has found Formosa having addressed 52 of 53 environmental violations. The inspection was carried out yesterday by a task force led by the Minister of Natural Resources and Environment, Minister Trần Hồng Hà. The one violation still to be corrected by the Hưng Nghiệp Formosa Hà Tĩnh Steel Company (FHS) is that it has not installed a coke dry quenching (CDQ) system, the inspection found. The company said it has already ordered two CDQ systems from Japan, and that the installation will be completed by June 2019. The CDQ process is said to be a more environment-friendly and energy-efficient one compared to conventional coke wet quenching. CDQ releases less dust, gas emissions and especially, no contaminated wastewater. 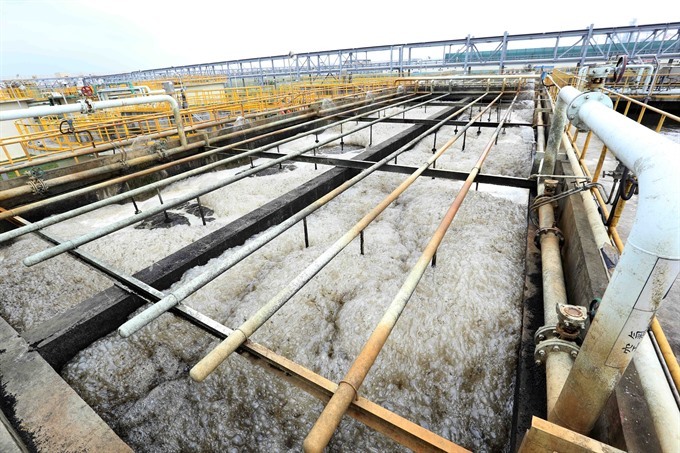 In the meantime, Formosa has constructed a wastewater treatment station with an automatic quality monitoring system. It includes a bio-waste treatment plant and one to treat sewage. It has also installed an automatic air quality monitoring system in its chimneys. Minister Hà also visited the company’s 10-hectare waste stablisation ponds, which are said to be a cost-effective method that uses microbes or heat from sunlight to deal with contaminants and pollutants. The manmade pond, scheduled for completion by the end of this June, is considered a highly important element of pollution management. Later, meeting with leaders of Hà Tĩnh Province and the company, Hà agreed with the assessment reports and noted the company’s efforts to mitigate the environmental disaster it had caused. He emphasised that in order to effectively prevent further environmental disasters, frequent technological inspections and assessments need to be done “scrupulously,” and the monitoring systems must be active round the clock. He urged further research and study into efficient re-use of solid waste and called for the development of a proper response protocol for environmental accidents. The quality of air and water in the company’s vicinity should also be monitored regularly, the Minister said. Formosa was found guilty of discharging untreated toxic waste into the ocean, causing mass fish deaths in four central coastal provinces last year. The pollution destroyed the livelihoods of around 260,000 local residents who depended on the sea to make a living.